Our first ever blog post. Let it be written. Jack Garcia, a recent Utah Valley University graduate, and Aaron Gates, a current UVU student—both English majors—decided to start peculiar out of a love for writing and a hope to recognize the creative talents of the often overlooked queer community within Utah’s unique culture. Emily Mattson, a graphic designer, came later to the project as Creative Director and designed the visual elements of the journal both inside and out. Together they seek to publish quality works regardless of theme or genre and only ask that contributors identify as queer and live within Utah. A new issue of peculiar will be published every spring and fall. The first issue was completed in May 2015 with funding from a small Kickstarter campaign. Volume 1, Issue 1 is 80 pages long and features a collection of poetry and short stories by 21 queer Utah writers, many of whom have never been published before. The editors also hope to print art and photography in future issues. 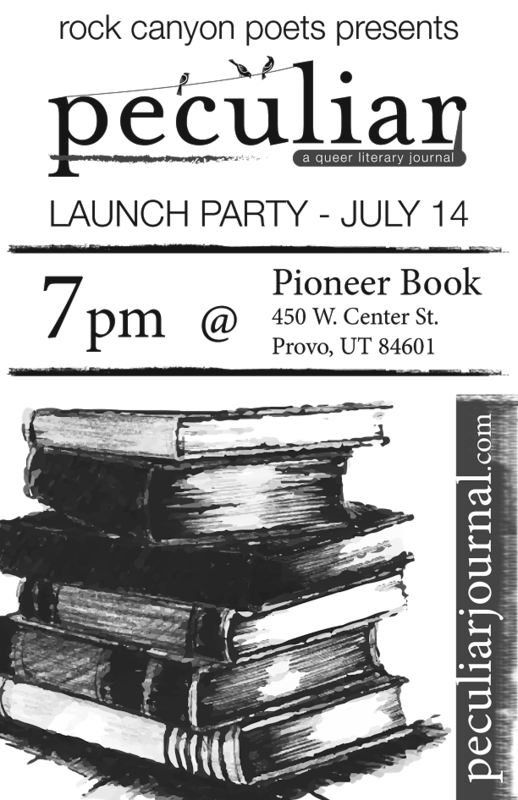 An official launch party will be held at Pioneer Book in Provo, Utah, on July 14th at 7:00 PM. Select contributors to the journal will read their poetry and prose, including Spencer Ballard, Brett Kesler, Teasia-Larin Bingham, Kajsa Nelson, Matthew A. Jonassaint, Hannah Irene, and Jai Hamid Bashir. Copies of the journal will be available for purchase.